The birdies are chirping, the windows are open and the magnolias are blooming...spring is officially here, y'all! You know what that means, right? 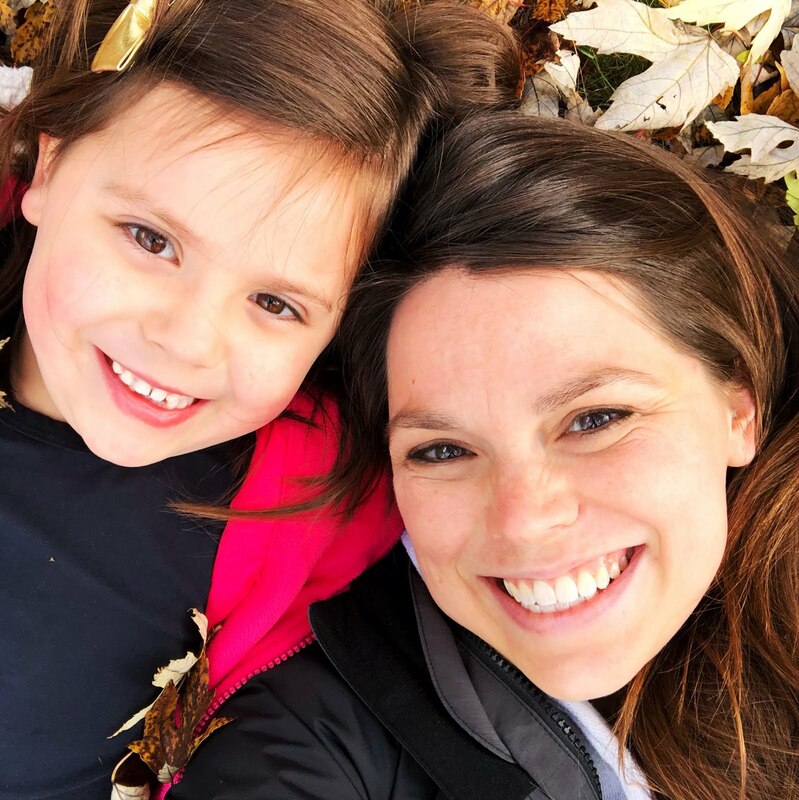 Yep, time to switch the sensory bin filler, and great news: Kinley and I have dreamed up not one, not two, but THREE super fun bunny themed ones for you. One might even say they were unBUNNYlievably fun...if one were a giant nerd...like me. 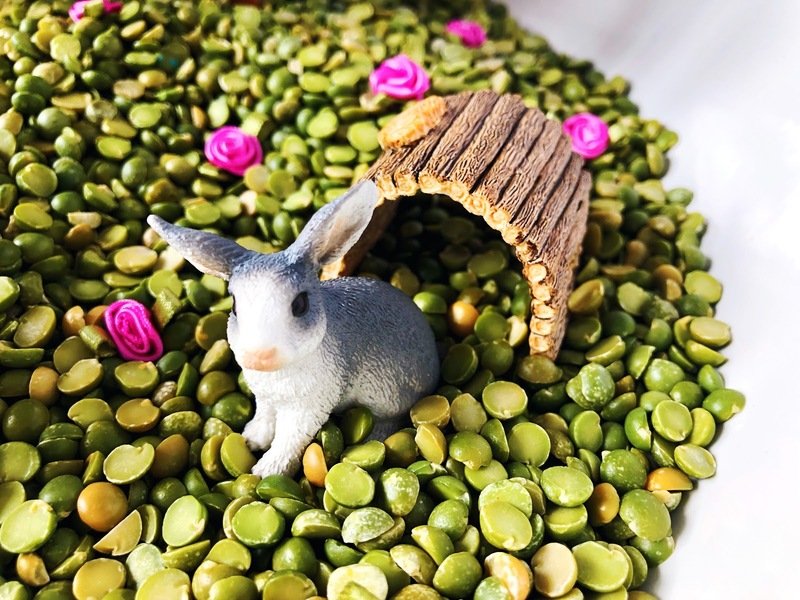 We used the brand-new rabbit hutch set plus an extra sweet little brown bunny that our good buddies at Schleich sent over for us to play and get creative with for all of the bins. They would both make totally perfect Easter basket treasures. I love stuff like that for K's basket -- candy disappears quickly (almost instantly around here ), but nice play-sets and little figures will be played and imagined with and loved for years. ** This is a sponsored blog post, but all ideas and opinions are my own. Thank you for your support. 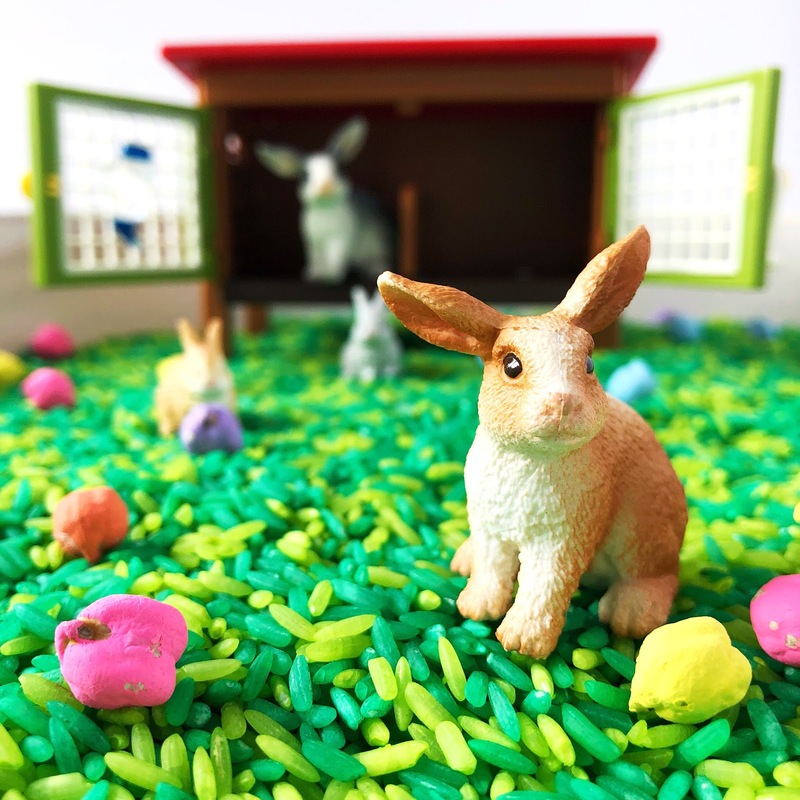 If you need one of these bunny hutch sets for your little ones, just click the pic above, or if you are more of a can't-wait-for-the-delivery-guy in-store kind of shopper, here's the handy Schleich store finder . While you are there, make sure you take a look around and see if you can spot the Schleich Red Bunny. If your kiddo snaps a selfie with him and you upload it to Facebook, you could win one of twenty gorgeous play-sets! Click here for all the details and for a list of all participating stores. You'll have to dye two things to make this bin happen, but don't be intimidated. The dyeing process is three-steps simple. Put white rice in plastic zip-top bag. Squirt green liquid watercolors (or food coloring) on top and give bag a good shake to coat the rice in color. If there is still a lot of white rice in there, just squirt more green on top and repeat the shake. Dump colored rice on a paper towel-lined cookie sheet and allow a few minutes to an hour to dry. I divided a giant cheap bag of rice into two big plastic zip-shut bags and used yellow and green together in one to make the lighter shade of green and then just straight dark green for the other bag, but you could totally just do all of one green or the other if you aren't feeling fancy. Rice is Kinley's ultimate favorite sensory bin filler because it's so fun to scoop and pour and it feels really nice in your hands, but this bin is next level because of the Easter-y bunnies and the little chickpea Easter eggs. Divide dried chickpeas into zip-top plastic bags. Squirt acrylic craft paint in pastel colors on top of the chickpeas (one color per bag) and shake them up to coat them in paint. If they aren't coated very well when you open the bag and peek at them, just squirt some more paint in a repeat. Dump out the paint-coated chickpeas on to paper towel-lined plates. You wanna keep the different colors separate while they dry so they don't mix. Allow to dry for 30 mins - one hour. They do tend to stick together initially, but break apart easily when they are dry without cracking or chipping the paint off, so no need to worry. We thought they would make perfect soft and smooth grass for the little bunny family and amped up the spring feeling a little by adding some of those little craft store ribbon roses -- isn't it all so pretty and inviting? Kinley had a good old time gathering flowers for the bunnies to pretend eat and roll around and sleep in. If you've been hanging out with us for a long time, you know that we are crazy for cloud dough. It's fluffy yet packable, and so irristably squishy. We've made plain regular white kind for moon dust, and sprinkles + vanilla kind for Kinley's birthday, but cocoa cloud dough is the ultimate best and it's edible (although not yummy at all) so even tiny humans who put things in their mouths can play with it! 3 cups of flour, any variety. I used the regular all-purpose bleached kind. 1/2 cup of vegetable oil, you could also use baby oil but it wouldn't be taste-safe if you did. Just throw all of those ingredients in a big bowl or even the bin you'll be playing in, mix them up with your hands (perfect job for little helpers) and you're ready to rock! Kinley and I used some little eraser carrots we had laying around to plant a garden for the little bunny family, but you could easily make some little carrots of your own out of play dough or clay, or even use real actual baby carrots. One of my Instagram buddies "planted" little brussels sprouts "cabbages" in a sensory bin garden the other day -- so smart, right? Anything goes! That is one thirsty little bunny! A quick note about sensory bins: If you take a quick scroll around Pinterest, you'll see all kinds of fancy bins and tables for setting these things up in, but the truth is all you need is some sort of container. A cookie sheet or a plastic tub works great. I set these up in a big pasta serving bowl. No matter what you use, your kiddo is guaranteed to have a blast. Cara Huff is a participant in the Amazon Services LLC Associates Program, an affiliate advertising program designed to provide a means for sites to earn advertising fees by advertising and linking to amazon.com.